Nonprofits today are competing with the best e-commerce websites in the world, along with the rest of the Internet, to capture the attention of their target audience. To meet this challenge head-on, they must begin to incorporate the best practices associated with the most highly trafficked Internet sites, not only to reach their target, but to entice a donation to their cause efficiently. Corporate sites such as Amazon, Zappos and Travelocity.com have spent millions of dollars in research to find out how to draw customers into making a purchase; nonprofits need to stand on the shoulders of these industry giants and leverage their strategies and tactics to effectively propel online donations higher. 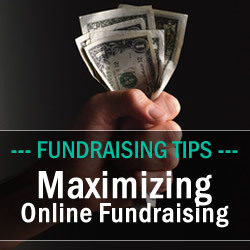 Nonprofits should begin their endeavor to maximize online fundraising by evaluating the organization’s basic website. Many times nonprofit websites have homepages that were literally designed by a committee. It’s common to see their homepages overflowing with information. While it seems like a great idea to ensure that anyone interested in the organization has immediate access to a litany of information in one place, the homepage becomes more of a distraction with this layout, furthering the chance that a potential donor could leverage it to make a donation quickly. The key is simplicity. It’s essential that nonprofits design their homepage and entire website keeping three questions in mind: who visits the site, what are they looking for and what do you want them to do? With these questions as a guide, a website can be redesigned with the intent of limiting the amount of information per page to exactly what’s needed to attract the right audience into making a donation decision. Limiting choices creates a more user friendly environment by directing visitors to make faster decisions. A nonprofit website that utilizes this principle well is bestieswithtesties.org. The best nonprofit websites are those that contain basic options that funnel potential donors into simple decisions, such as to access more information, get involved and donate. Best-in-class designed e-commerce sites point customers to the ever important shopping cart and check-out options, in the same manner a nonprofit’s website must highlight and distinguish their donation button. While the rest of the website should be designed harmoniously with the brand in mind, the donation button needs to stand out. The donation button should be large and extremely easy to find on each page of the site. As potential donors click through an organization’s website, any given page may yield a heavy influence on their donation decision, so having a prominent donation button in the same location on each page makes that decision easy. Like popular consumer sites, nonprofits need to draw in their target audience to make a positive decision quickly. When potential donors interact with an organization online, they need a simple way to be added to the nonprofit’s email fundraising campaign and general mailing list, which serves as a fine-tuned communication medium intent on creating a relationship between them and the nonprofit. In the midst of so many options today, email campaigns remain by far the most inexpensive and valuable way for nonprofits to raise funds online, so it’s essential to ensure potential donors’ email addresses are captured on the homepage. Currently, the best practice in the industry now is to have a popup window that asks anyone who views the website’s homepage to opt into an email campaign or mailing list to learn more and to keep updated on a nonprofit’s latest news. The top-selling international consumer brands today leverage powerful images and videos to communicate emotions that create a strong connection with their target market. Nonprofits can do the same by incorporating multimedia to relate their most high-impact storyline on their websites and social media pages. Imagery and video segments that strongly illustrate the core mission to donors also have high potential to go viral in support of the cause through social media. Share the story of the nonprofit’s mission on each page of the website with visuals, such as personal stories, images and videos of those the nonprofit has helped. Don’t miss an opportunity to demonstrate how the organization is making a difference today through the organization’s efforts through a variety of multimedia. Building up industry best practices to further maximize fundraising efforts, nonprofits can now launch a new fundraising campaign in minutes, not hours and days, with the latest online donations tools available. Leveraging the organization’s current website and email campaign lists, donations and registrations are completed online, enabling all the information to be easily exported into spreadsheets and imported into a database, saving hours of manual entry. With today’s available online fundraising tools, nonprofits can build forms and make changes easily, allowing for testing on a range of appeals, donation levels and messaging. The data is provided in real-time so a fundraising campaign and its associated forms can be evaluated on its ongoing performance. Today’s top industry e-commerce sites follow the same basic formula to powerfully capture, funnel and leverage the attention of their target audience to its maximum effect— making a purchase. It’s time that nonprofits look to these major brands and implement their methods to move their donation strategy solidly forward. They can start by not missing an opportunity to leverage the latest fundraising technology to maximize these overall efforts. Jamy Squillace, director of product management, Abila, has 16 years’ experience in product planning and management. At Abila, Jamy creates and evolves fundraising and grant management solutions to fulfill customer desires, exceeding expectations.